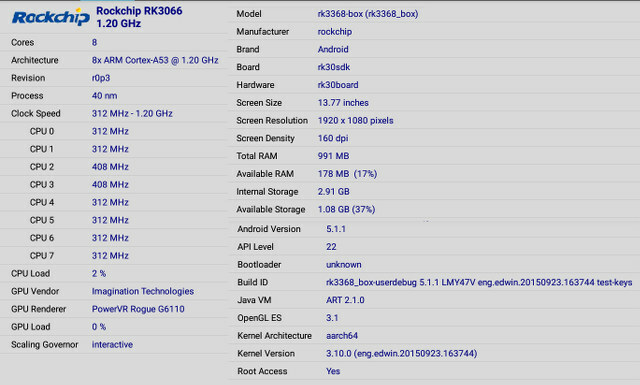 Kingnovel R8 is one of the many Rockchip RK3368 based TV boxes on the market, and since I’ve already provided the specs, as well as pictures of the device and board, I’ll carry on with the review today. While I’m usually testing video playback in Kodi, I’ve only spent a short time with Kodi 15.2 on this box, and instead switched to VLC (aka VideoLAN), an another open source media player, and my favorite program to watch videos in my Ubuntu computer. 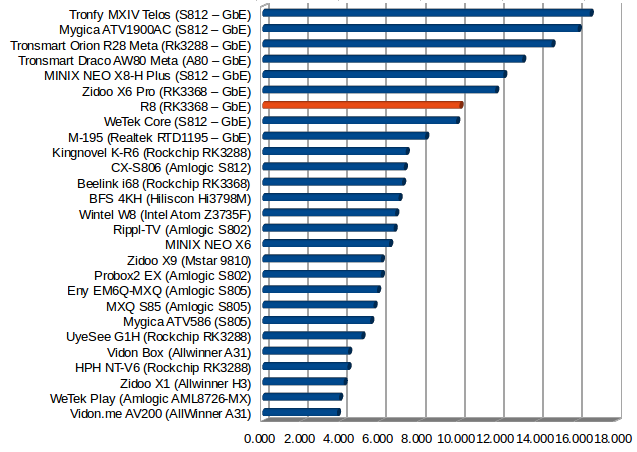 Of course, I’ve also tested most hardware features and performance of the device. Since I like to test worst case scenarios, I also make sure I use all the ports of the devices, and connected a USB hard drive, USB RF dongles, USB webcam, and relevant cables to the device before powering it up. Once you connect the power, I recommend you have some tea while waiting for the boot to complete, as it will usually take around 2 minutes and 20 seconds. The launched is called Carbon Metro and includes Kodi, YouTube, Facebook, Twitter, Skype, Netflix, a Web Browser and a link to “Setting”. I’m not going through the whole settings today, as they look exactly like the ones in Zidoo X6 Pro up to the “Ehernet” typo, except printing is also enabled. The 8GB partition has been partitioned in to a 2.91GB “internal storage” partition with 1.89 GB free, and a 2.88GB “NAND flash” partition. I could not see any major issues with settings, and I could change video output to 2160p60 with the user interface resolution fixed at 1920×1080, and I had no problem with Ethernet and WiFi connection to my router. 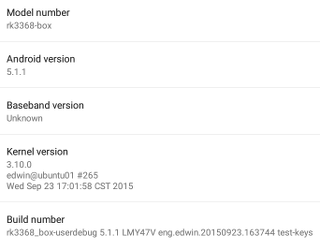 The About device section only shows a generic “rk3368-box” model name with Android 5.1.1 on top of Linux 3.10.0. I’ve added two AAA battery to the remote control, and I have to say the remote is pretty nice to use (for an IR remote) thanks to its compact size and fits well into my hand, and I tested up to 10 meter without issues. Having said that I only used it a few minutes, and switched to an air mouse instead which is much more convenient in Android. I could install all apps I needed for the review from Google Play store or Amazon Underground, after side-loading the latter. So as long as you don’t connect any USB devices all is fine, but if you leave your USB hard drive attached is will still be powered on in power on, although it’s completely turned off in standby mode. When I connect all USB devices used for review, the power off consumption goes up to 3.1 Watts. One good news is that the box temperature stays in control, and the Rockchip processor does not massively throttle like in Zidoo X6 Pro. The maximum temperature on the top and bottom of the device was respectively 41°C and 54°C after Antutu benchmark, and 42°C and 57°C after playing Riptide GP2 for 15 minutes. 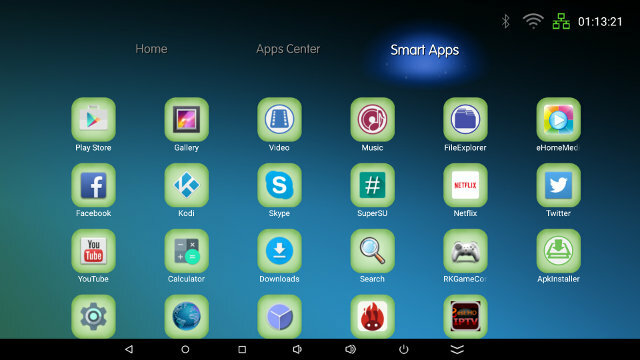 The firmware does not seem to have massive bugs and never frozen, but Android would very often show the messages “Carbon Metro is not responding” or “Unfortunately Carbon Metro has stopped”, either because of poor implementation of the launcher itself, or more likely, the very slow NAND flash used R8 TV box. Switching from an app to Android home screen by pressing the home button on the remote will normally take 5 seconds, and apps don’t start very fast either, and sometimes the system feels rather sluggish. So unfortunately the first impressions were not very good mostly due to very slow boot time, launcher issues, and overall sluggishness. Even though I’m going to focus on VideoLAN in this review, I’ve still had a look at Kodi. I was somewhat impressed than Kodi 15.2 is pre-installed, as the firmware is a few weeks old, and many still used Kodi 14.2. Kodi is also pre-loaded with TVAddons which I previously tried, provides lots of pirated content, and is despised by Kodi’s developers. bbb_sunflower_1080p_60fps_normal.mp4 (H.264 @ 1080p60 + AC3) – Video OK, and the AV receiver showed “Dolby D 5.1”, but it sometimes switched to “Unknown” and audio was cut for less than one second, before resuming audio and “Dolby D 5.1” output. HD.Club-4K-Chimei-inn-60mbps.mp4 (4K H.264 @ 30fps + AAC) – The video was not very smooth. Fifa_WorldCup2014_Uruguay-Colombia_4K-x265.mp4 (4K, H.265, 60 fps + AC3) – The video was not smooth, and audio played fine (Dolby D 5.1) was a while before continuously making a “machine gun” like noise. Finally, I’m very happy not too have gone through the torture that would have been to run a full video playback test with Kodi on this firmware. You’ll probably want to find another version of Kodi maybe from Google Play, or the version recently released by Zidoo which has been specifically optimized for RK3368. 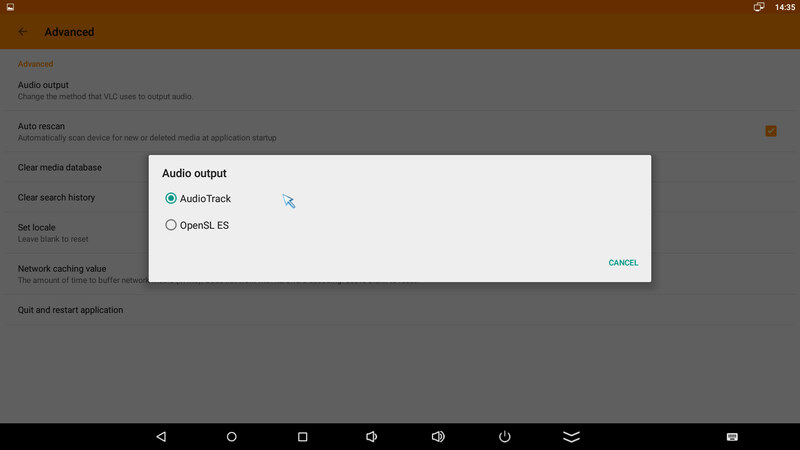 VLC for Android beta – Version 1.0.0 last updated on December 9, 2014 with 50 to 100 millions installs. If you only look at the app title, you may have thought the beta version has the latest developments, but checking the details clearly shows the beta version is not updated anymore, so you’ll want to install VLC for Android, which is exactly what I did. The first boot might slow as the app will scan for media files on your system, especially if you have connected an hard drive with lots of videos or/and pictures, and since this happens in the foreground, you’ll have to be patient. Unfortunately after a while the app would just exit without any crash log files (vlc_logcat_<…>.log) in the root of my “internal SD card”. That problem is reproducible 100% of the time, maybe because I have two many files, or maybe because I have multiple partitions with the same directory structure (double files), and somehow that confuses the app. 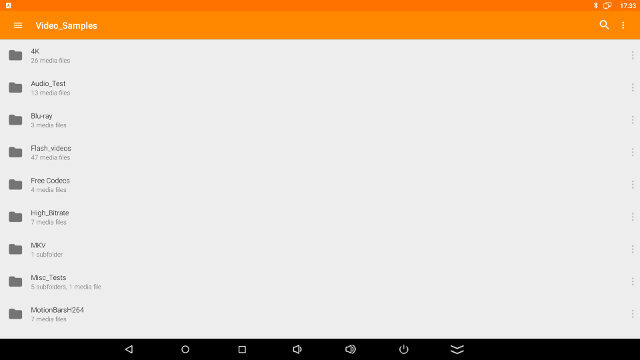 Since I normally play videos over SAMBA, I just disconnect the hard drive, and the app started normally, but then I found out that SAMBA is not supported by the app in VLC Android FAQ. You should be able to work around that by mounting the network shares with another app, but instead I just copied the sample videos in a USB flash drive, and after the scan I could see all my videos. Yeah! The videos are grouped by filename, and all Big Buck Bunny videos were in one single “group”. This looks nice, but for testing purpose it’s much easier for me to get a file list. It works, but the user interface is clearly optimized for phones, as a lot of space is unused. All good so I started by playing 1080p video samples found in samplemedia.linaro.org, but unfortunately I only got a black screen (without mouse pointer or volume display possible) with audio playing fine. So I went to the settings and following some recommendations from the Android FAQ. 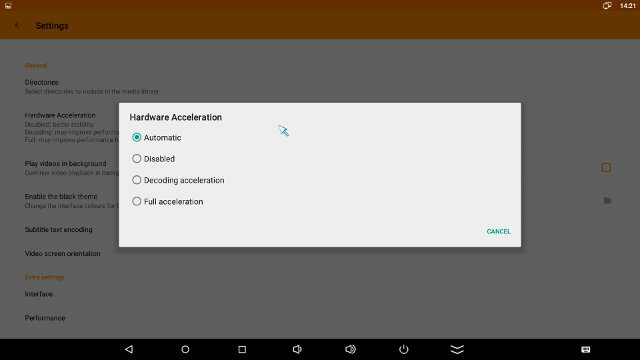 The settings page shown above have various option for subtitle, video orientation, background video playback and so on, but I went into the hardware acceleration menu and try all four options, and only “disabled” worked for me. Please note that you may have to quit and restart the app for it to work. Then I went into the Performance section, and forced video chroma to YUV as it’s supposed to provide the best performance, and it also worked on the device. Finally, I had a look into the advanced options, and check the audio output which allowed selection between AudioTrack and OpenSL ES. I simply kept the default settings. DTS HD High Resolution – PCM 2.0 only. So with hindsights, it was not such a good idea to run VLC on an Android TV box, as the app is probably optimized to run on the most popular phones or mobile SoCs like Qualcomm, Samsung, or Mediatek. I installed Antutu Video Tester 3.0 manually and the results were in line with other RK3368 mini PCs with a score of 516 points. I’ve transfer a 278MB file between the internal flash and a SAMBA share to test WiFi performance. Kingnovel R8 has one of the weakest WiFi performance I’ve tested so averaging 1.24 MB/s, and in the second test the transfer stalled a few times. Had it not stalled performance would have been higher, but not much, probably around 1.5 MB/s. I did the same test for Gigabit Ethernet, but with a larger 885 MB file, and the file was transferred at 10 MB/s. This is slower than most devices with Gigabit Ethernet device, but as we’ll see later the bottleneck should be the slow NAND flash, just like in WeTek Core TV box. So I’ve also tested dual duplex raw performance for one minute using “iperf -t 60 -c 192.168.0.104 -d” command line, and the performance is OK at around 600 Mbps in both directions. I’ve tested Bluetooth transferring photos using Iocean M6572 smartphone, and a Bluetooth audio headset. Both worked. A micro SD card formatted with FAT32, as well as NTFS &, EXT-4 partitions in my USB hard drive could be access in read/write mode, but not exFAT nor BTRFS. 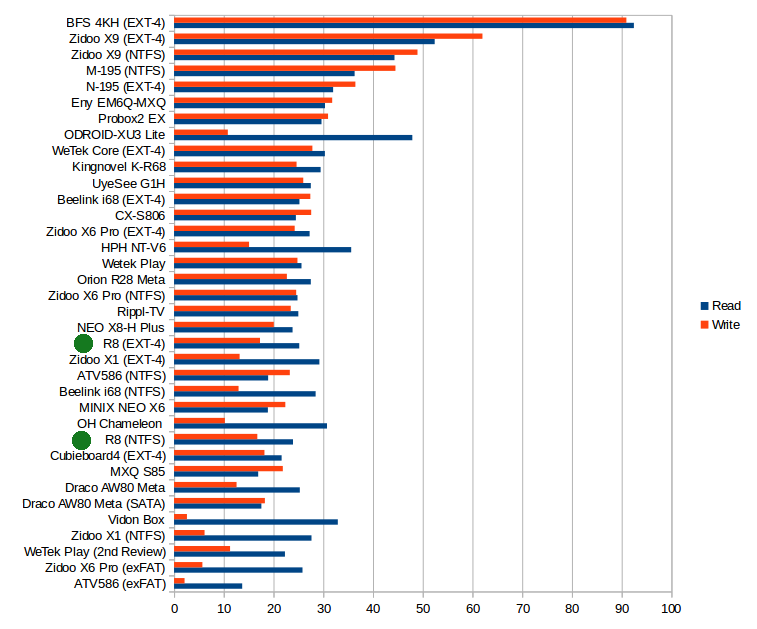 Performance is acceptable for a USB 2.0 connection, but write speed should be optimized. The internal storage felt slow at boot time and during usage with some apps, including the launcher, often becoming irresponsive. A1SD benchmark confirmed the impressions, as the flash could only achieve 14.02 MB/s reads, and 4.85 MB/s writes. Some other products like WeTek Play and WeTek Core also have slow internal storage, but somehow they’ve managed to setup their firmware in a way that it does not affect the user experience much. Candy Crush Saga worked without issues as in most devices, and Riptide GP2 was quite smooth, and remains very much playable after changing the graphics settings to the “highest resolution”. 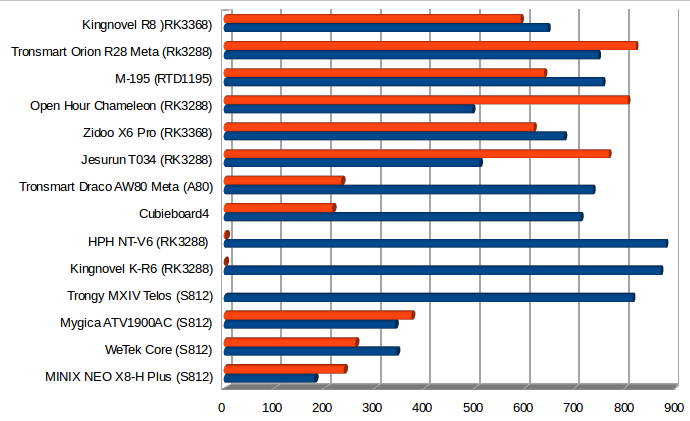 If you still thought RK3368 would be clocked @ 1.5 GHz as advertised, that’s the third device were CPU-Z shows it clocked @ 1.20 GHz maximum. The board model is simply rk3368_box. 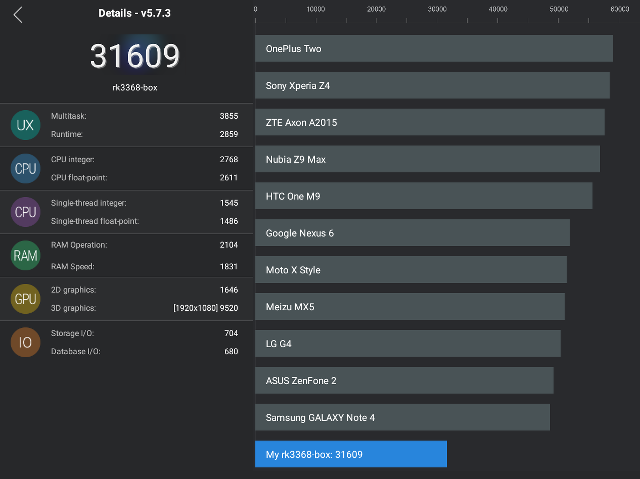 I’ve only run Antutu 5.7.3 benchmark this time, and R8 achieved 31,609 points, a bit below to the 34,101 points I got with Beelink i68, but still well above the ~25,000 points in Zidoo X6 Pro which throttles a lot. (Note that X6 Pro will also get ~34,000 points if you run Antutu right after booting, but the score will decrease if your run Antutu after using the box for a while, and once I even managed to bring the score down to around 11,000 points after playing a 4K H.265 videos at 60 fps for one hour). 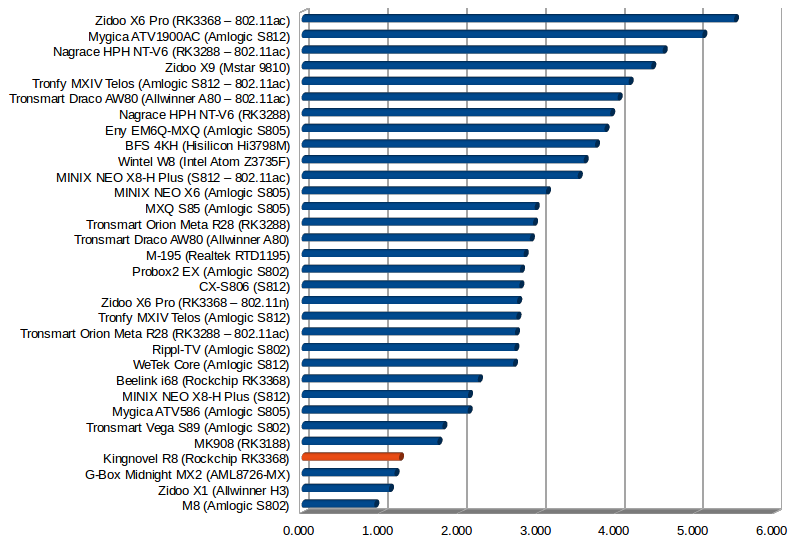 This time I’ve got a two parts conclusion: one for VLC on TV boxes, one for Kingnovel R8 specifically. 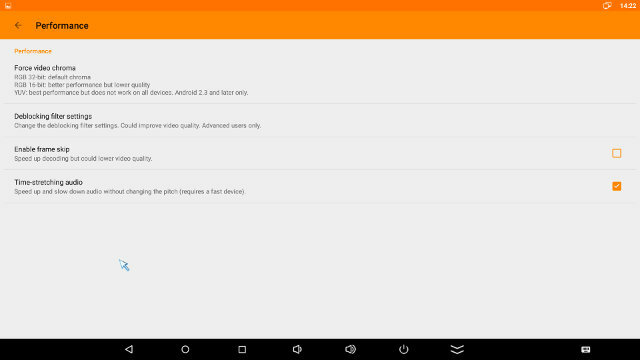 VLC for Android has been installed on tens of millions of devices, and the app has a pretty good rating of 4.3 out of 5. 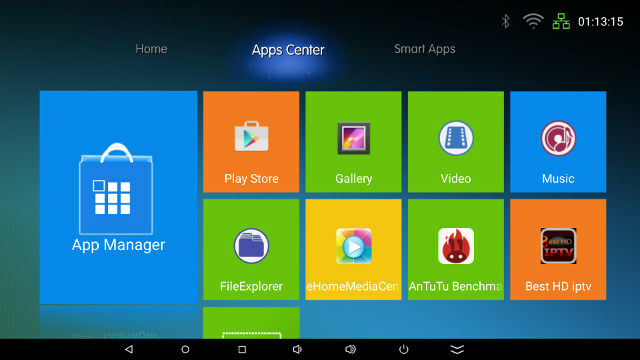 However, it’s quite likely developers are focusing their efforts on popular smartphones and tablets powered by Qualcomm, Samsung and Mediatek processors, as my VLC experience on Kingnovel R8 TV box was very poor without hardware acceleration support, and software decoding struggling with 1080p videos. I could not connect to network shares either, but all these potential issues are pointed out in the FAQ. Since VLC is my favorite player in Linux, I was hoping for more, but unfortunately it should be avoided in (Rockchip) TV Box. 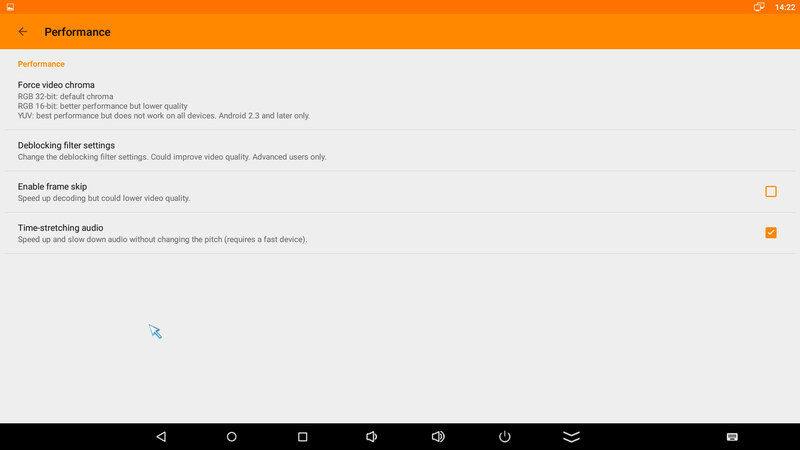 That does not mean VLC won’t run well on any TV boxes, as the app supports Android TV operating system, and an earlier preview version had been tried on Nexus Player. 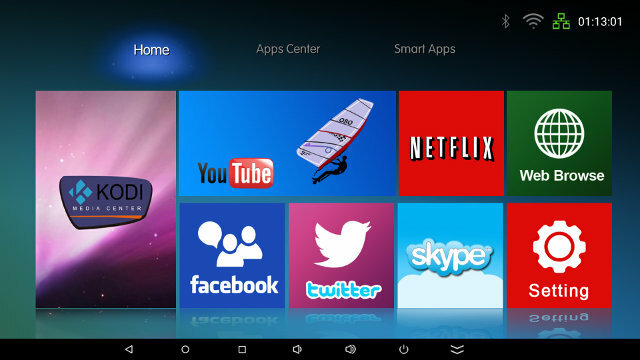 Sadly Kindnovel R8 is yet another disappointing TV box both due to firmware (e.g. sluggish launcher), and hardware issues (e.g. slow NAND flash). I’ve compiled some of the pros and the cons for the device. Proper power handling with standby & power off but one caveat: USB power is not turned off in power off mode. Kodi 15.2 did not well with the three videos I tried: Neither 4K H.264 @ 30fps and 4K H.265 @ 60 were smooth, and HDMI audio pass-through was not reliable (Audio cuts while playing). Kodi may also be quite slow to exit at times as in many other devices, and that version is pre-loaded with TVaddons (piracy issues). The issues might be eventually fixed, and if you are a distributor you may either request Kingnovel to improve the firmware responsiveness, or ask them to provide a faster flash device. I’d like to thanks Kingnovel for providing the sample for review, which can be ordered in quantities from the company, see R8 product page. While I would not recommend it, individuals can purchase “R8 TV box” on GeekBuying, Ebay, Banggood, or Aliexpress with prices starting at around $76, but the hardware in the device may be slightly different than the one reviewed (e.g. 2GB vs 1GB RAM), and the provided IR remote control is different. 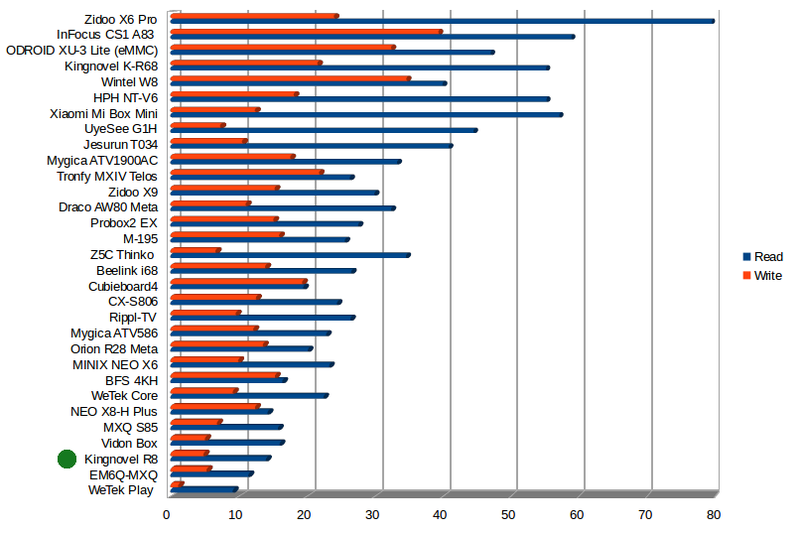 Looks like every TV box these days has serious issues with doing what it’s supposed to: playing videos smoothly. That’s why I want to ask you if you could make an article with recommendations, like “best all-rounder”, “best for 1080p/4K” etc. Also I would suggest that you try testing how MX Player works with this box. 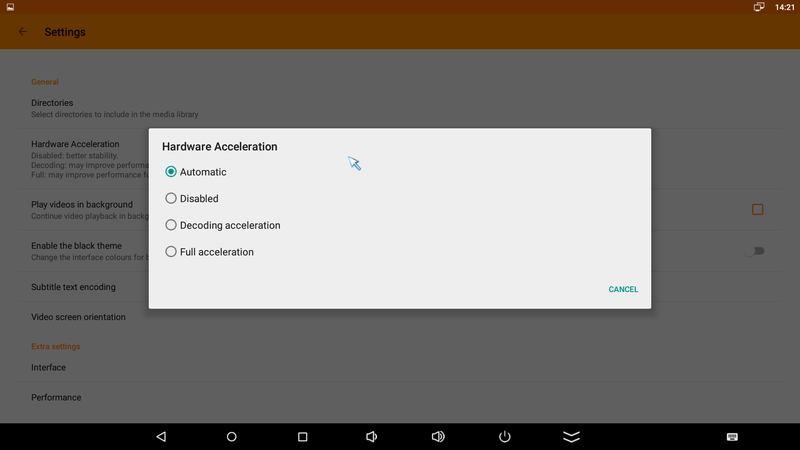 It has 3 video decoding modes (HW+ disabled by default, HW and SW) and 2 for audio (HW/SW). I’m mentioning it because so far on all of my Android devices I had a better playback experience with it than with VLC and while I don’t know much about TV boxes I think it’s worth checking if using that app makes any difference or not. in my experience,on android device with H3, RK , MT, and quallcom SOCs, somtimes video dont play as it suppose to. 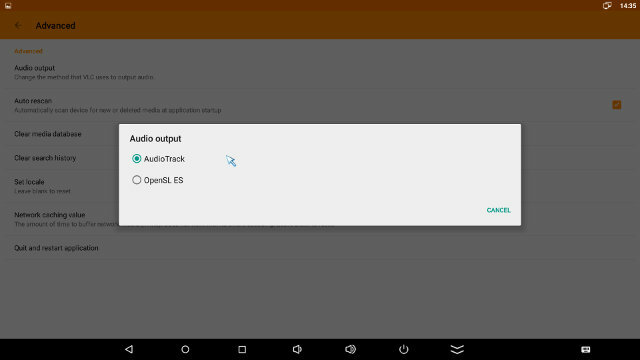 some problem exist on MX player, while not to be on VLC, and vice versa. soo, i always have both app on my devices. I used to do reviews with MX Player until Kodi got ported to Android, and many people seemed to prefer Kodi. MX Player is pretty good, and I still use it sometimes in review when Kodi does not manage to play some video files. As for recommendations for video playback, your best bet is with Amlogic devices and that’s why I’m eagerly waiting for S905 TV boxes. 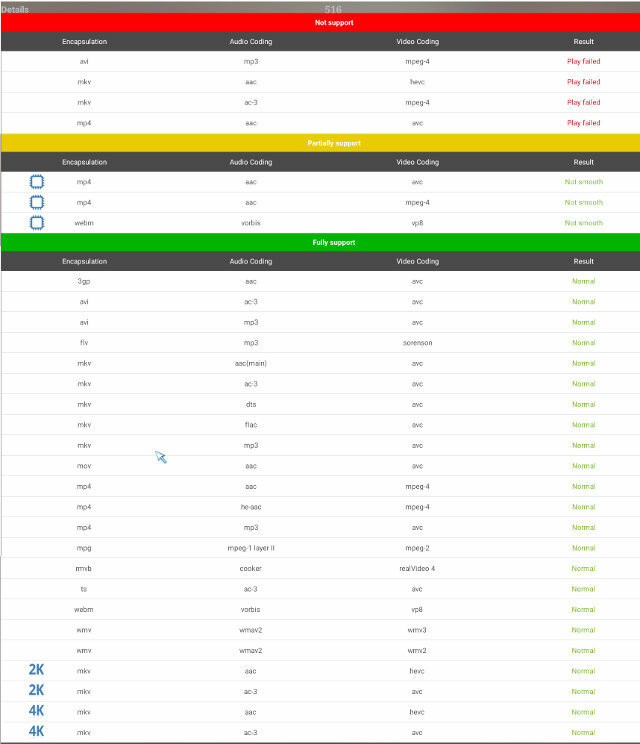 I use bsplayer without many problems on most boxes. 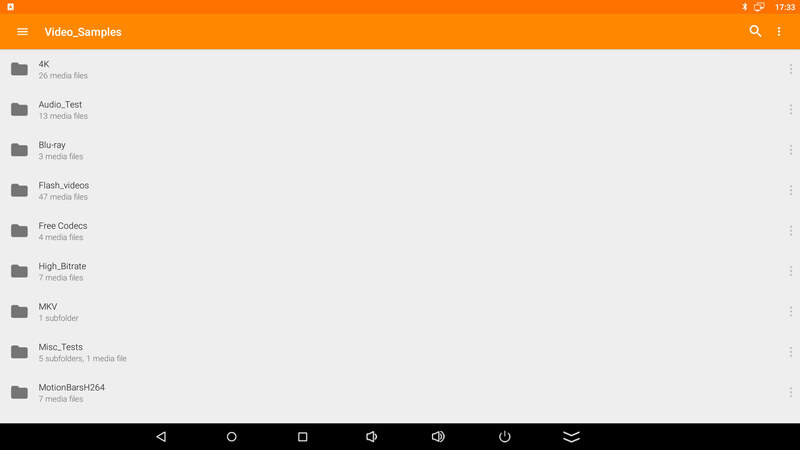 My vlc experience on Android mirrors yours so far, horrible. 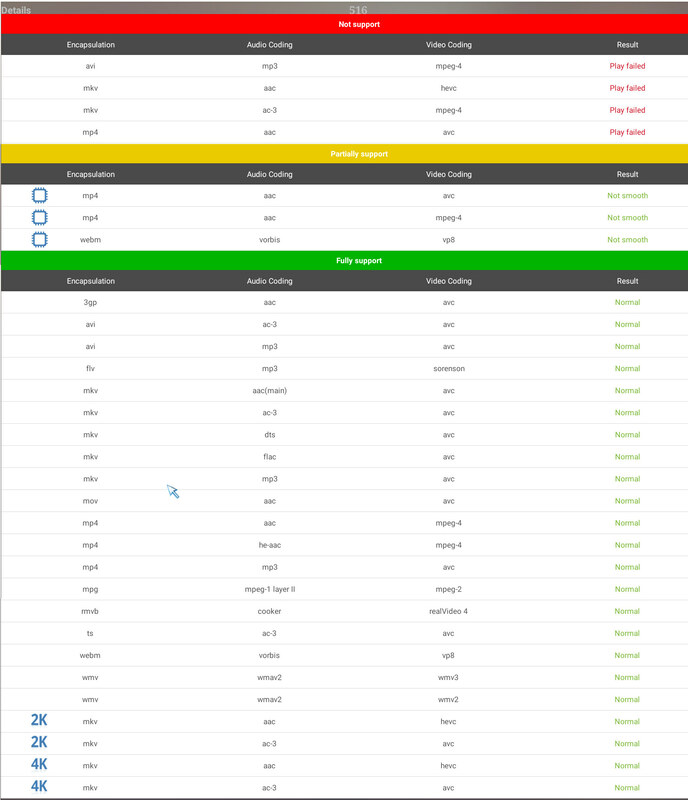 No SMB support is a nonstarter for me. How do you force mount the shares? You mentioned an app of some sort. Thanks for the reply. I’ve used them for browsing, but not mounting. I’ll have to see how that works. I’d like to find a jpg / png etc. browser which can browse such mounts as well. I have a very old app I use everywhere acdsee, on windows, but have not found a simple browser utility like that for android. It is a picture by picture browse I have to use thru the default HTML from my readynas html interface, and is quite laborious. http://acdsee.com is the page, don’t know if they have any gui examples on there. But the browsing is all I am interested in. I see they have an ios client, and mac, but no android I saw. thanks for this review, it is a great resource and insight into a lot of things I’ve tried with the units I have. This was a lot of work for you but is very informative with all you covered here. I’m not sure about AndSMB, as I’ve not used for years. I just thought it would mount the shares somewhere. Kodi has a Picture section and supports network shares, but I’ve never used it.